SUBHEAD: President Trump orders military to prepare for escalating violence in Syrian conflict. 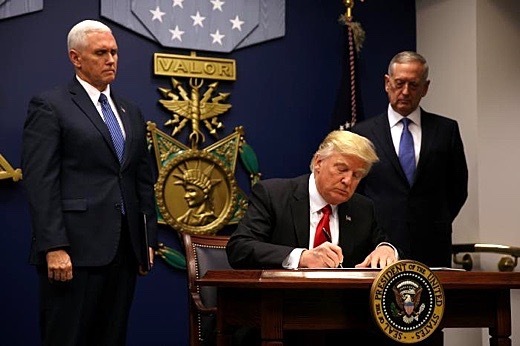 Image above: US president Donald Trump, in the Hall of Heroes at the Pentagon, signs an executive order on Friday witnessed by radical fundamentalist Christian Vice President Pense and war criminal Secretary of Defense retired General "Mad Dog" Mattis. From (http://www.cbsnews.com/news/trump-military-extreme-vetting-executive-actions/). During a visit to the Pentagon on Friday, President Donald Trump issued an executive action calling for stepped up violence in Syria and a vast expansion of the US military, including its nuclear arsenal, to prepare for war with “near-peer competitors”—a reference to nuclear-armed China and Russia—and “regional challengers,” such as Iran. During the visit, his first to the Pentagon, Trump signed a second order, “Protecting the US from Terrorist Attacks by Foreign Nationals,” that freezes visa and immigration applications from predominantly Muslim countries. The military order directs Defense Secretary James Mattis, who was sworn in at the ceremony, to complete a 30-day “readiness review” designed to prepare for the destruction of ISIS in Syria and Iraq, along with “other forms of Islamic terror.” Last week, Mattis was confirmed by the Senate in a 98-1 vote. And it commands the Pentagon and the Office of Management and Budget to develop a “military readiness emergency budget amendment” that would increase military spending in the current year and increase the budget for 2018 and thereafter—increases to be offset by cuts to social spending. The Presidential Memorandum, only three pages in length, is the blueprint for world war. This would include the “modernization” of the US nuclear force, a greatly expanded missile defense system, and increased emphasis on cyber warfare, which aims to cripple the retaliatory capacity of major adversaries by targeting their digital and telecommunication command structures prior to an American strike. These actions follow on a move by the Obama administration to implement a $1 trillion upgrade in the country’s nuclear arsenal. The executive action did not put a price tag on new military spending, but media speculation indicates that the figure could approach an additional $100 billion per year. Trump’s military plans hew closely to a Heritage Foundation proposal that calls for the revamping of the nuclear force, the expansion of the Navy to 350 ships, the Air Force to 1,200 fighter and attack jets, the Marine Corps from 24 to 36 divisions, and the Army to more than a half a million soldiers. The US currently spends approximately $600 billion on its military annually—excluding expenditures on the intelligence agencies and Veterans Administration— more than the next nine largest military spenders combined. American “defense” spending accounts for, by itself, over one third of all global military spending, and it consumes the great majority of the federal discretionary budget. Increases in military spending, coupled with Trump’s promises to drastically lower taxes on corporations and the rich, must inevitably be paid for by cuts to education, health care and infrastructure, and by plundering Social Security and Medicare. In securing the presidency, Trump capitalized on popular hostility toward Hillary Clinton’s interventionist stance on Syria and her saber-rattling against Russia. But his executive order’s demand for escalation in Syria increases the likelihood of war with both regional power Iran and nuclear-armed Russia. Russia maintains its only significant foreign military base in Syria and has so far preserved the regime of Bashar al-Assad in a war for regime change orchestrated by the Obama administration. Trump’s order for a plan to destroy ISIS and “radical Islam,” which he declared in his Inaugural Address he would “eradicate completely from the face of the Earth,” will be drawn up by Mattis, responsible for numerous war crimes in the US occupation of Iraq, including the killing of untold thousands of civilians in the 2004 attack on Fallujah. While the US now makes war on ISIS, it has funded and directed Al Qaeda affiliates in the regime change operations in Libya and Syria. Yet in remarks made last summer, prior to his nomination to defense secretary, Mattis claimed that, in his view, ISIS was nothing more than a stalking horse for Iran to extend its influence throughout the Middle East. It is widely rumored that Mattis left command in the Obama administration because he favored a more bellicose approach toward Iran. Even before Trump’s order became public, figures in and around the military speculated that Mattis would propose a dramatic escalation in Syria. Scott Murray, a retired Air Force colonel involved with previous aerial bombardment of ISIS, told NPR that this could be done by lifting rules preventing the targeting of civilians. Officers who spoke with the US government’s overseas broadcaster Voice of America (VOA) complained of the Obama administration “micro-approving” actions in Syria. “Every single person had to be approved,” an unnamed Defense Department official said of a contingent of 203 Special Forces soldiers sent into Syria last year. Currently most of the 6,000 US military personnel in the region are concentrated in Iraq, where, joined by Iraqi forces, they are subjecting the city of Mosul to a massive attack. Trump’s order will likely lift the fiction that there are separate war theaters in the neighboring countries. There was also speculation that the US could bolster the Kurdish People’s Protection Units (YPG). This would heighten tensions with NATO ally Turkey, which views the YPG as a proxy of the Kurdish Workers Party (PKK), against which it has waged a nearly four-decade counterinsurgency war to prevent the emergence of an independent Kurdistan. An escalation in Syria is also prefigured by Trump’s anti-immigrant executive order, which, with the express aim of blocking refugees from fleeing the crisis, envisages the creation of “safe zones” run by the US military—in blatant violation of Syrian sovereignty and international law. Under the plan, Syria’s refugees would be placed in what would be, in all but name, US-administered camps, overseen by the US military.